Bob Donegan, president of Ivar’s, with Captain Catfish at the Boston Seafood Show in 2018. Donegan will present WSU's annual Burtenshaw Lecture, 1:25 p.m. Thursday, Feb. 28, in the CUB auditorium. 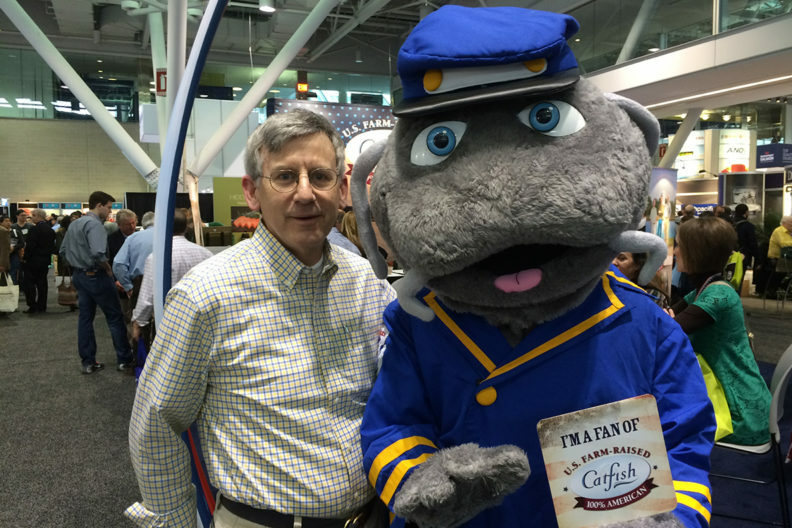 Bob Donegan, president of Ivar’s, will present “Ivar and Ivar’s: How Our Flounder’s Quirky Hospitality Lessons Have Worked for 80 Years” during the annual Burtenshaw Lecture, 1:25 p.m. Thursday, Feb. 28, in the CUB auditorium on the Washington State University Pullman campus. The public is invited. The presentation will be live streamed via YouTube. Donegan will share his expertise in helping to lead Ivar’s seafood restaurant since 1997. He joined the company as the chief financial officer and was asked by his partners to become the president on 9/11 when another of their partners died. Since then, the company’s employment, store count and revenues have tripled. The company continues to be a favorite among consumers and was named for having the “Best Seafood” in Evening Magazine’s 2018 viewer poll. Donegan is involved in many community activities and serves on the boards of the Seattle Chamber, Seattle Aquarium, Seattle Sports Commission, Washington Hospitality Association, Seattle Historic Waterfront Association, and Economic Advisory Board of the Federal Reserve Bank of San Francisco. He has been an active and vocal member of Seattle’s downtown and waterfront communities and was one of the Sand Hogs (a group of business, labor, environmental and community representatives named after workers who dig tunnels) who created the tunnel-plus-transit solution resulting in the Bertha Tunnel, which opened Feb. 4. He also served on the design and operating committee for the new seawall and waterfront park. The Burtenshaw Distinguished Lecture Series is sponsored by alumnus DeVere Jerry and Angelina Burtenshaw in memory of their son, Calvin Brett. The lecture is presented annually by the WSU School of Hospitality Business Management.